This is a splendid suit! Somehow, Indy Magnoli has interpreted my haphazard measurements and clues: and the result is a suit which looks as if it was made by a tailor who's measured me, rather than by someone on the other side of the world. 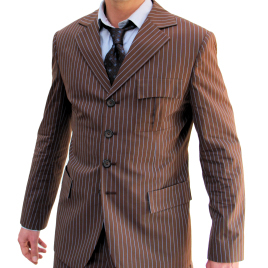 I asked for the suit in the navy: admittedly not a very David Tennant choice but it's a super cloth, very dark with a beige stripe - very like a genuine 1920s suit that I once had. I'm looking forward to ordering my next Magnoli suit.